In this "hallmark" (Los Angeles Times) silent nail-biter, a rash of murders evokes a family's suspicions about their tenant, a man fascinated with their beautiful daughter. Restored and Remastered! Includes Audio Commentary, Audio Interviews with Peter Bogdanovich and Francois Truffaut, Making-Of Featurette and More! I ended up enjoying this one even though I'm still not overly fond of silent movies. Hitchcock also didn't use many of the title things throughout the movie, so you have relie on just on the visuals. Most of the time that ends up working fine with this one, though with a few scenes earlier in the movie I was left wondering why a scene or two was included. The movie starts off showing the discovery of a victim. She was the seventh victim. Blonde women in London are scared with some of them seeming to plan to change their hair color. A young woman, Daisy, works in some sort of musical. she lives with her older parents. Soon after she arrives home that night, a man arrives wanting to rent the room her parents have available. The Lodger, never identified by a name, acts mysterious, seeming to sneak around, flipping out over things that happen in the house. He also becomes attracted to Daisy and she is returning the feelings even though she had been somewhat involved with an older police officer, Joe, who didn't like the Lodger on sight. I thought the plot was very interesting even though I'm still not sure why a few things were done. There is a good amount of suspense in the movie and mystery in the movie. The cast all handled their roles well and were very expressive, something absolutely essential in a silent movie. There are some very good, interesting visuals in the movie, like when Hitchcock filmed up through plate glass to show someone pacing upstaris. This is a black and white movie that didn't really seem to be in black and white to me. Just about every scene had a blue or sort of golden hue to them. The scenes set indoors have the golden hue and the ones outside have the bluish cast to them. One scene late in the movie had a pinkish/purplish cast to it. All the color hues was a bit odd to me since I'm use to black and white movies that are truly black and white. One sequence, set in the house late at night, was in what I consider true black and white, but that didn't last long at all. I think the picture quality is good, especially considering the age of the movie. I think some restoration had been done on it for this DVD release. I still have to watch more of the extras. I did watch the one on the making of the movie which was interesting. A lot of people who have written books about Hitchcock talked about the movie and how it was one of the first he directed - I think it was the third. Hitchcock's granddaughter talked a little bit as well. I've seen his daughter in several extras, but never his granddaughter before. Peter Bergdaovich - no clue how to spell his name at the moment - talked a lot about the movie and Hitchcock too. Some clips from interviews that Bergdaovich did with Hitchcock in 1962. This is a good movie overall, though I know it won't appeal to a lot of people because it is silent. It's still worth seeing. I've heard it described as the first true Hitchcock movie since it was the first suspense type of movie he did. This is a black and white movie that didn't really seem to be in black and white to me. Just about every scene had a blue or sort of golden hue to them. The scenes set indoors have the golden hue and the ones outside have the bluish cast to them. One scene late in the movie had a pinkish/purplish cast to it. All the color hues was a bit odd to me since I'm use to black and white movies that are truly black and white. One sequence, set in the house late at night, was in what I consider true black and white, but that didn't last long at all. You're being a bit quick to label it black & white! Films from this era were often tinted sepia and the other tones. It's cheap transfers down the years that have presented them as basic black and white, probably to avoid confusion, but it isn't what was intended. They really were far more colourful than you might think and would literally dye the film. But restorers now try to go back to how they would have looked. I seem to remember Nosferatu having a choice between original sepia or black and white when the restored version was released. It doesn't mention if they restored to Hitchcock's original colour choices, but I think it must be almost impossible to distinguish between the choices like this made by anyone from the directors to the producers. Nice to see you joining us, Marie. Even the information I read about the movie said it was black and white which I why I said that. It must have been the sepia in most of the scenes indoors. I got mine as part of the one set that has like 8 of his movies. I picked up the set when I found it on sale at Amazon. I've seen some of the other movies in the set available alone, so maybe this one is as well. At least I'm slightly less behind than I was. I did go check out that page you found. Lots of interesting information there. My copy of this movie is part of the set I have that has like 20 different movies and some television show episodes. The picture quality isn't too bad considering the age of the movie, but it could have been better. It's obvious that no restoration had been done for this release. I've seen most of the remake with Jimmy Stewart, but that was so long that I've forgotten most of it. I think the basic plot is the same, though this movie is shorter, so less happens. It does get off to a slower start showing the family on vacation. The way the family interacts makes it seem like they aren't that close at times..but that changes once Betty is taken. Once the friend is killed, the pace starts pick up and things get more interesting. It wasn't that smart for Bob to sent Betty off to the room alone. I think there is a decent amount of mystery and suspense in the movie. I did notice a few techniques that Hitchcock would use in his future movies. The climax of the movie is very well done and works well. Overall I enjoyed this movie and think it is worth seeing. This must have been the first Hitchcock film I ever saw. It used to play on German TV often I possibly saw it each and every time. It has, however, been at least 20 years since I saw it last. It is a great little film. It has lots of Hitchcock's typical ingredients: MacGuffin, suspense, witty dialogue and plays out with a rather high pace that the 90min pass by very quickly. The first 30min we are slowly and ingeniously (because of the way the focus is passed on from one to the other) introduced to all main characters. This bit plays mostly like a comedy with light hearted humor and only a hint (well, a murder) that this is not a comedy at all. The second 30min are the mysery section, where "The Lady Vanishes" (I don't think I need a spoiler tag here ) and the conspiracy plays out. The last third is the suspense section, where we finally gain more knowledge than the characters in the film and Hitchcock has us worried about how it will end! Hitchcock does appear, but near the end of the film, so I missed him. A good movie. I liked the middle part best. But again the video and audio quality made me loose my complete attention to the movie, so I must have missed a lot of important information. How come, that all passengers covered the disappearence of the lady? Some of them, as far as I gathered, did it, to get not involved in any interogations and because they didn't want to hold up the journey. Good use of rear projection for its time. I was a little distracted when I first started watching this one, but I ended up really enjoying the movie overall. The plot was interesting and there is a decent amount of suspense with what is going on. The characters were interesting and seemed more..likable at times as well. It does seem like Hitchcock was trying to push the limits of what he got in the movie, especially with that scene involving the stockings. That had to be shocking when the movie first came out. 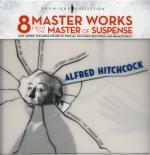 My copy is part of my set with several Hitchcock movies and a few episodes of television shows. The picture quality really isn't that bad even though it hasn't been restored. I'm making progress on getting caught up at least even though I'm still behind. lol But I've made progress. I'm still further behind though..I think I still have like 4 to get through before The Lady Vanishes. But at least I've started to catch up, so that's something. Though it may still take me till December to finish. Novelist Edgar Brodie (John Gielgud) has his death faked by British Intelligence. Giving him a new identity as Richard Ashenden, they persuade him to undertake an espionage commission in Switzerland. Accompanied by beautiful Elsa Carrington (Madeleine Carroll), posing as his wife, and the General (Peter Lorre), an insane professional killer, Brodie/Ashenden becomes embroiled in murder, intrigue and a pursuit through the Swiss Alps. This one is interesting, though not one of Hitchcock's best. The set up is interesting, though it isn't the most logical for British Intelligence to turn an author into a spy on a mission to kill someone. He had no training in that sort thing, so it seemed rather out of place to me. Elsa added more believability to the cover, but that was about all she did. She acted like she was on a fun adventure without any thoughts of the consequences of what was going on. She seemed to start to feel bad about certain things, but that wasn't fully explored. Then, even when she knows everything, tries to prevent something ..and even threatens to do something that seemed rather...illogical. The General was an odd character..very odd. The movie has an odd mix of humor and more serious moments that doesn't fully work that well. My version of this is part of the set with a bunch of the older Hitchcock movies. The picture and audio quality wasn't that great, and in some parts it was so dark it was hard to tell what was being shown. I was and yet I had no idea that was there!